There are numerous system improvement tools that fall in and out of fashion and I have utilized several of them (quality circles, TQM, MBO etc.). I enjoy using the latest; six sigma. The credit for coining the term “Six Sigma” goes to a Motorola engineer named Bill Smith. Incidentally, “Six Sigma” is a federally registered trademark of Motorola. Six Sigma and Lean six sigma are tools used to streamline manufacturing and production processes with the emphasis on eliminating unnecessary steps and utilizing added value steps only. Six Sigma and Lean six sigma systems have the same goal but take different approaches to success. The two identify the root cause of waste differently but do complement each other. Lean practitioners believe that waste comes from unnecessary steps in the production process that doesn’t add value to the finished product. Six Sigma proponents assert that waste results from variation within the process. Think in terms of the only way to determine if something has value or not is to consider whether a customer would be willing to pay for it. 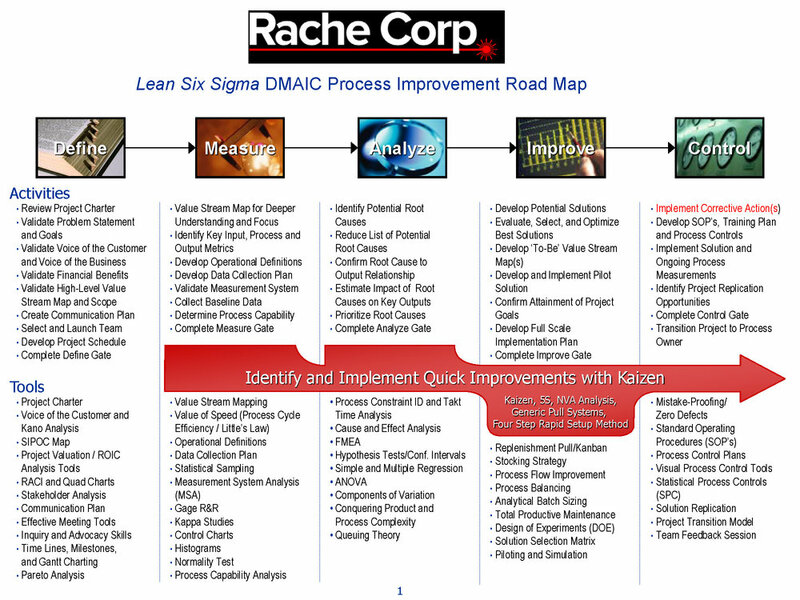 Rache Corporation is offering this editable DMAIC PowerPoint template to the reader as one of many Six Sigma tools to assist in improving your particular challenge. To obtain your copy of this template, please send your request to steve@rache.com or click the "Contact Us" button on our website (www.rache.com).